Even today, nearly half of all pregnancies in the United States are unplanned—either unwanted or mistimed. A little over half of the 3 million unplanned pregnancies each year result from the failure to use any kind of birth control at all while virtually all of the remainder is due to inconsistent or incorrect use. Why don’t women who don’t want to get pregnant use birth control? Why do so many women who don’t want to get pregnant not use contraception? Cost may be one factor. But most women now have health insurance (either through their employer, Medicaid, or an exchange) and the majority of these women have access to the full range of FDA-approved contraceptive methods with no cost-sharing due to provisions of the Affordable Care Act. To be sure, there are still gaps. The bigger problem is the more human challenge of doing the things we know we should, but often find difficult in practice. Women forget to take their pill or get their prescription refilled. Their partners may fail to use a condom for a variety of reasons (e.g., less pleasure, none available at the moment, influence of drugs or alcohol). Many young adults are simply ill-informed about the risks of pregnancy and options for preventing it. New long-acting forms of birth control such as the IUD and the implant help to overcome these problems. They are much more forgiving of human error. They change the default from getting pregnant—unless you are very careful—to not getting pregnant until you decide you want to. Making these highly effective contraceptives available leads to sharp declines in unintended and teen pregnancies. But the decision to use one of these newer, hassle-free options follows an even more basic one: does she want to become a parent? 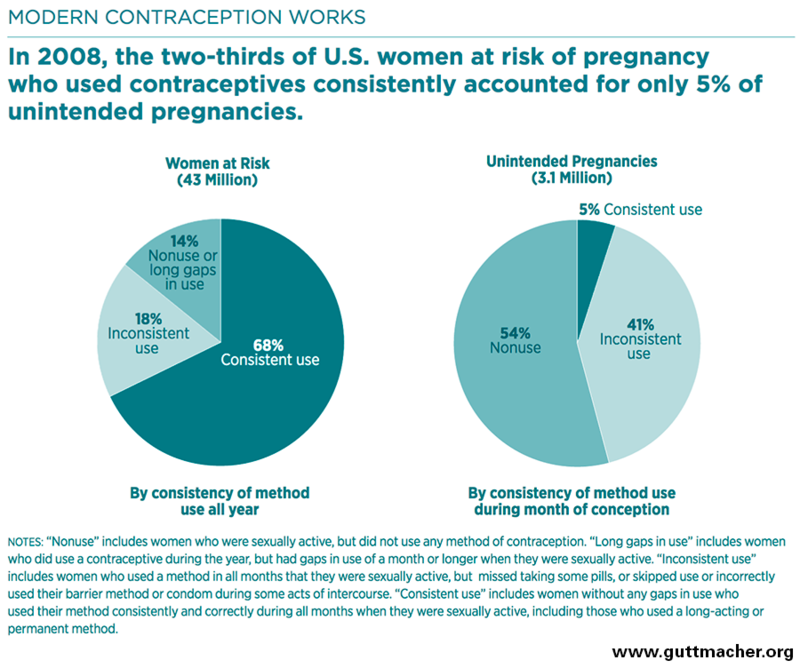 Of the other 90 percent (all of childbearing age), almost one-third were not using any form of contraception. By asking the One Key Question, physicians get a much better idea of exactly what the patient needs—should she receive preconception advice (e.g., about nutrition) or does she need advice on her birth control choices, assuming she is sexually active? Perhaps even more importantly, the question serves as a nudge to the patient to think harder and more concretely about her own plans in a space where confidentiality is assured and counseling about options available. A few local and state programs are proving that improving access to and reducing the financial burden of highly effective contraceptives works. St. Louis’s Contraceptive CHOICE project and a program in Colorado to provide long-acting reversible contraceptives (LARCs) free of charge resulted in sharp declines in unintended and teen pregnancies. Planned, timely childbearing can improve the educational and labor market outcomes for women, particularly low-income women, as well as the life chances of their children. It is vitally important to improve access to and affordability of contraception. But we can also encourage women to plan for a pregnancy by routinely asking them one simple question—do you want to have a child?